Game design isn't that different from other disciplines like art or architecture. 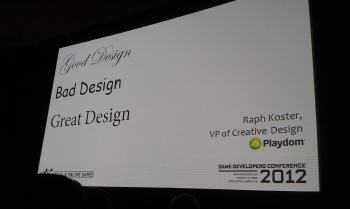 At the "Good Design, Bad Design, Great Design" panel at GDC 2012, Raph Koster was extremely honest. Koster has been in game design for a long time and was instrumental in creating MMOs as lead designer on Ultima Online and Star Wars Galaxies before branching into social games as a creative lead at social gaming house, Playdom. All that experience has taught Koster that everything in game design relates back to things like psychology, business, architecture, and other design fields that have been around since the start of human history. Koster believes developers need to start applying the lessons learned in other fields to their games. "We all have trouble often pointing at what great design is," Koster said. "We can all have our own opinions, point at games we think are totally awesome, see them fail at the marketplace and wonder what the hell happened. The thing is, there are a lot of lessons from other fields here. Over the past year, I've come to believe that game design is just another field of design." Koster pointed out specific game design guidelines he gleaned from other sources. Some of these can be condensed to platitudes such as, "Good design is familiar. Bad design is boring. Great design is exciting." Koster compared good game design with the mere exposure effect in psychology. The fact that we look at something familiar and because it is familiar to us, we assume it's better. "This is a simplistic example of how design works using human nature as its canvas. That's kind of the quintessence of design in general," said Koster. While that's something every creative person should keep in mind, most of Koster's principles are more strictly about games. "Good design celebrates accomplishments (Peggle is a fantastic example). Bad design loudly celebrates minor accomplishments. Great design enables accomplishments." Calling attention to minor accomplishments instead of enabling them is a big problem, especially in social games. Games use the psychological concept of framing to reward players. It has its place - "After all, we gotta eat, people," said Koster. But social games are plagued by too much framing. "The point of social games is not to persuade the player to play the social game more," Koster said. "The point of social games is to enable the player to have fun. That is why we do what we do. There are other mechanisms we can use [outside of the game] to persuade people to do things over and over." At the end, Koster admitted that he hasn't always followed these guidelines. "I have let bad game designs ship for fear of my job. I have let commercial considerations override the needs of the player. I may not succeed, but I always want to do great design." The crowd at GDC took to Koster's panel quite well, rewarding his frank lecture with a standing ovation. Good design guides players. Bad design controls (like linked quest narratives - "You have to click a button, to receive a pellet of story, to click a button, to receive a pellet of story. We're not guiding, we're controlling.") Great design invites with expressive power. Good design teaches. Bad design lectures. Great design helps you teach yourself. Good design does what the user wanted. Bad design does what the designer wanted. Great design does what the user didn't know they needed. Good design gets people to play for utility. Bad design gets people to pay as quickly as possible. Great design makes money as an incidental consequence, "not because it's what it set out to do"
Good design makes companies. Bad design can make plenty of money. Great design builds legacies, cultures and communities. "The sign that your game rocks is that a community has formed around it." Good design executes on the possible. Bad design ships on time. Great design reaches for the implausible.